I was so honored when my sister-in-law asked me to re-do her living room. 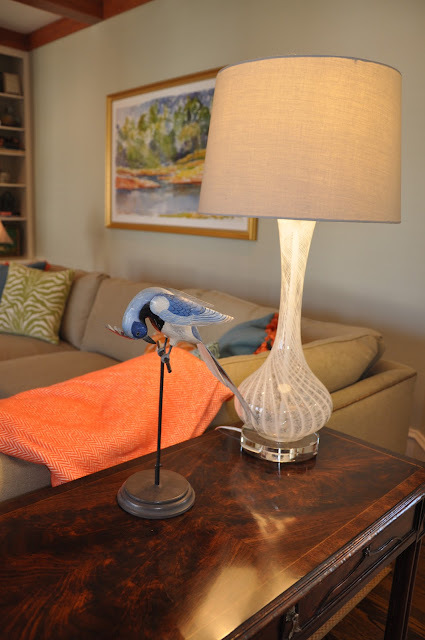 Her beautiful house in Greenville, NC is full of great accessories and antiques. 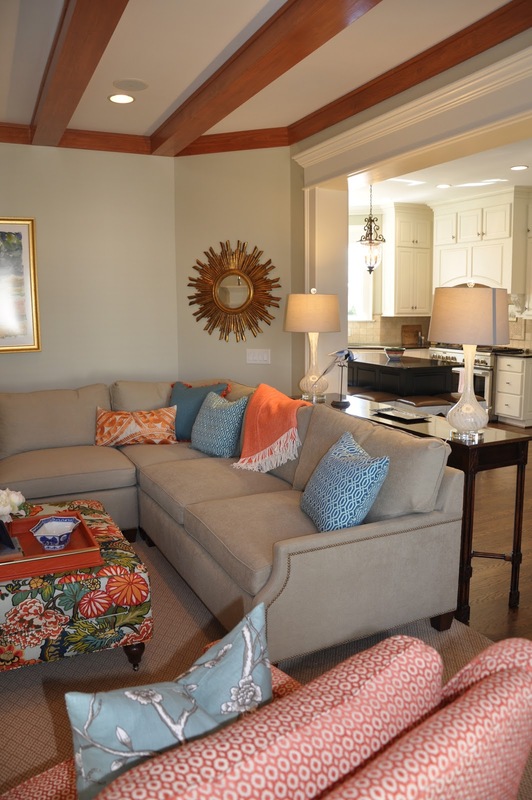 It has a traditional classic vibe, that I love, but she wanted to amp it up a notch. We started with Chiang Mai Dragon in aqua. It worked with the greens/blues and golds she already had throughout the house. Instead of pulling out the red she has throughout, we went with orange. 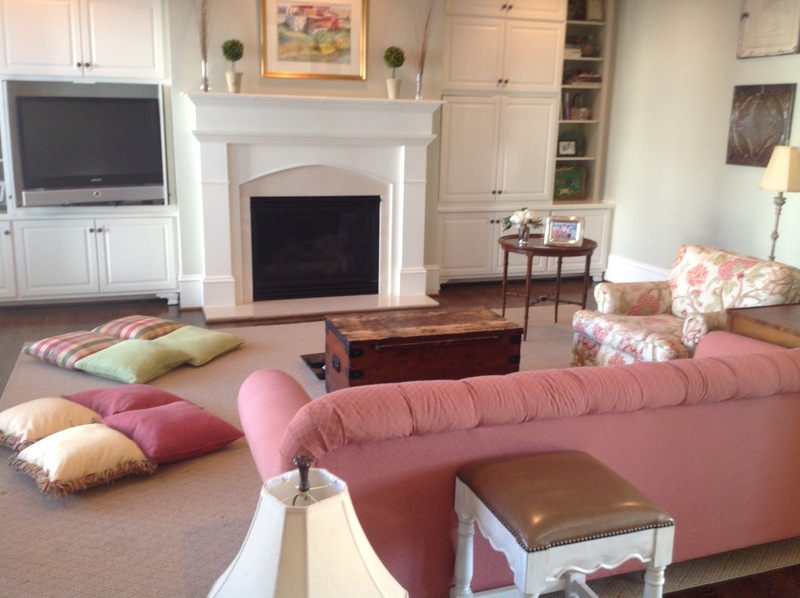 A custom sectional allowed for additional seating, but also makes this huge room seem cozy. I designed the style of the arm to add a little modern touch and finished it off with nail heads which accentuate the lines. We scored this beautiful console at auction. 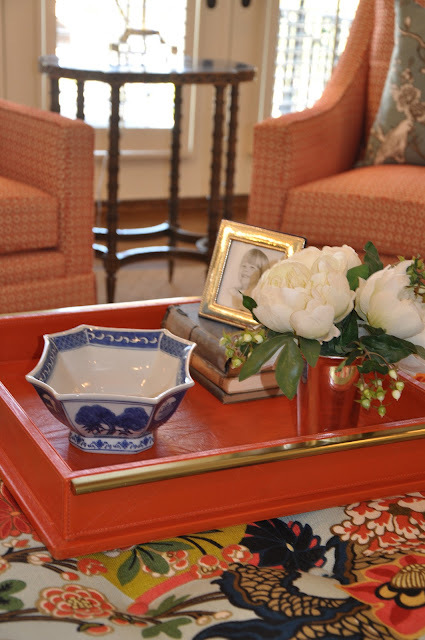 I love the details and how it warms up the space and ties in the antique tables throughout the house. 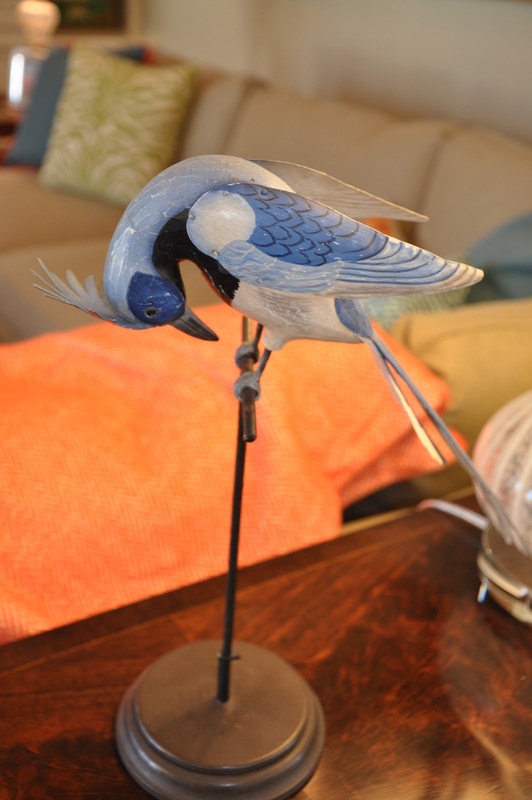 It was easy to find great accessories as her house is chocked full of great pieces. We added a couple of colorful items with a twist to update the accessories and mix in some fun. 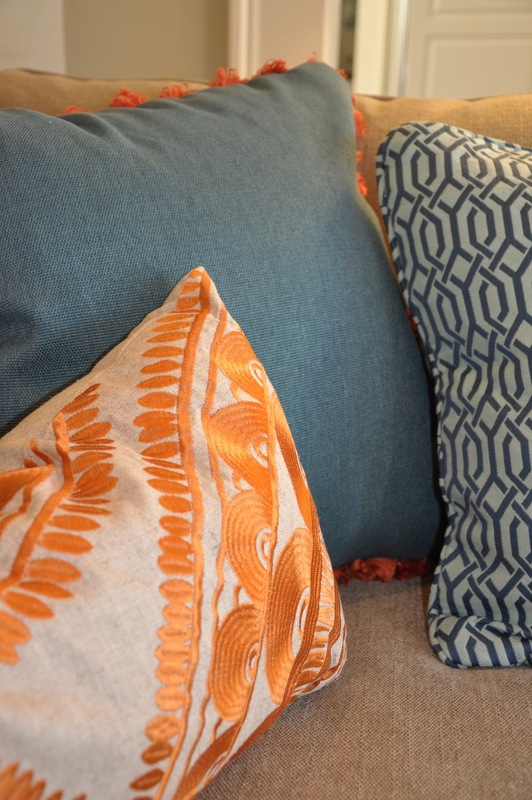 Custom pillows mixed with store bought finds spice up the sofa and chairs. Thibaut upholstery fabric added to these custom swoop style chairs makes for traditional seating with with a modern twist. Love this! That couch is awesome! 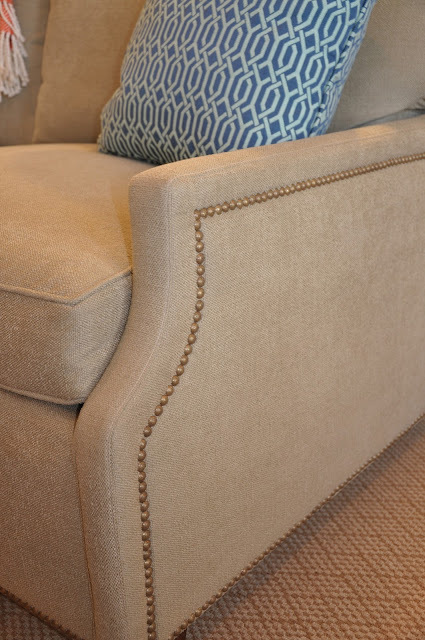 The arms and the nailhead make it. 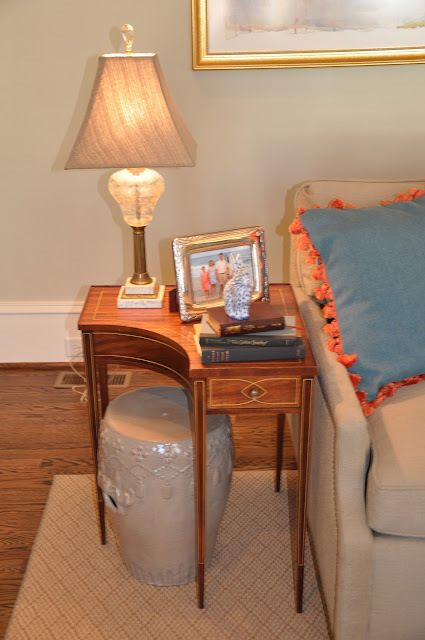 Love the fabric on the ottoman and the accessories that pull in all the color! Also so glad you did the orange! Kind of updates it but still very classic and traditional! Great job! What a beautiful room. The details that you designed are stunning. 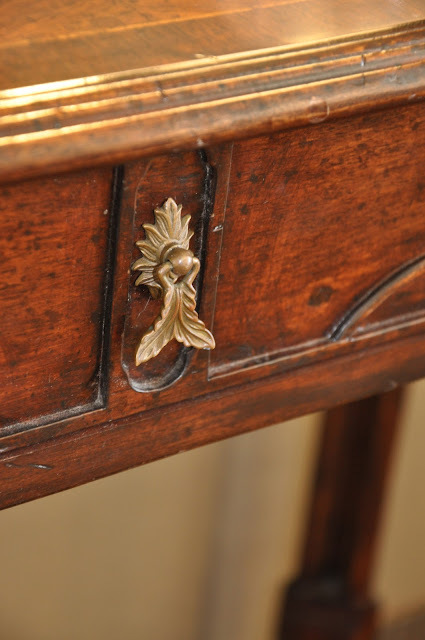 I am in love with that table you found at auction.